HONOLULU, Hawaii _ A 2.4-meter-width white runway, four boxes of white confetti, 200 kilograms of dry ice, white spot lighting and white screen on the back of the stage. These are usual white elements celebrated South Korean haute coutre Andre Kim, who is famous for his signature look in a white suit, uses to create a dreamy stage to tell a pure, romantic love story filled with his garments. Except for white confetti this time, the rest of the elements successfully helped bring out the atmosphere that Kim intended, during the 2007 Spring and Summer Andre Kim Fashion Art Collection held in Hawaii, Wednesday. Over an hour, the runway at Hilton Hawaiian Village Beach Resort and Spa was filled with 143 sets of Kim's garments in a variety of colors with diverse patterns and silhouettes. They were inspired by tropical Hawaii, ancient Korean royal costume and patterns and more, with a little bit of Western culture flavor thrown in. Having actor Jung Joon-ho, actress Kim Min-jung and actor Shim Ji-ho as main models, the show's mood was elated, accompanied by genres of music ranging from opera arias and ballet numbers to sultry Latin music and chanson. The show was organized to help raise funds for the apparel product design and merchandizing program at the University of Hawaii, in which 160 students were studying. A total of $140,000 was collected during the models time on the catwalks. Some 1,000 spectators were on hand, including Hawaii State Governor Linda Lingle. The event also commemorated the 20th anniversary of KBFD TV, a local broadcasting station specializing in airing Korean programs. The station hosted the show. "It was the first time for me to see Andre Kim's fashion show. It was a great show, breathtaking. Its variety made me interested in what (clothes) would come next (during the show)", Lingle told The Korea Times. "He gave us a unique treat". Before the fashion show, however, Kim received six appreciation certificates from local government offices and organizations, including a proclamation from the State of Hawaii. "We presented the proclamation, signed by me, to Andre Kim in acknowledgement of his artistic contribution to Hawaii", Lingle said. The governor added "Hallyu", or Korean Wave, is big here in diverse fields such as fashion, food and especially soap operas. Although she is too busy to watch any TV programs, a lot of her friends watch Korean TV dramas on daily basis. Following the presentations of the certificates, four stages of the show unfolded. 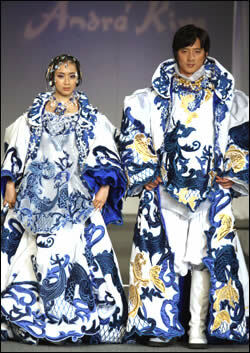 The first stage, titled "White Fantasy for 2007", was followed by "Red Carpet Festival", a second stage show that featured dresses with timeless paintings. The third stage, "My Love for Land of Calm", showed evening gowns, and Kim concluded with the fourth staged titled "Legend of Swan Lake". Actor Jung Joon-ho and actress Kim Min-jung graced the final stage. Kim also showcased the 2007 collection on the volcanic island Tuesday as part of a banquet to congratulate the opening of SBS Open, a golf tournament under the Ladies Professional Golf Association (LPGA) in the United States. The two shows were the designer's first overseas runway appearances this year. The first show featured four LPGA golfers as models, including Ahn Si-hyun. Andre Kim is scheduled to continue his overseas tour this year. He will present his pieces in Shanghai on Apr. 5 and in Washington D.C. in May. Korean film director Shim Hyung-rae plans to release his blockbuster movie "D- War" at major cities of the United States, including Los Angeles (LA), around the end of November, 2006. China is trying to benchmark the South Korean animation industry to develop its own cultural industry, including animation. Can K-Pop Stars Go Beyond Asia? While Beijing and Tokyo saw Rain, this month it was New York City's turn.